Almost everything in Beijing is on a large scale: the size of the city, the population, the public spaces. Tiananmen Square and the Forbidden City are two of the most prominent examples, both immense and fascinating. And even more so is the Great Wall, a part of which I had the pleasure of hiking this week. 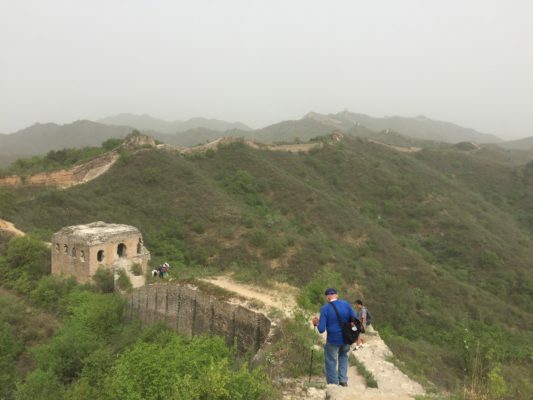 The Great Wall was built continuously from the 14th through the 17th centuries during the Ming Dynasty in order to protect China from Mongol and later, Manchurian invaders. It runs a distance of 8,850 kilometers east to west. Of that, where the physical terrain was barrier enough, wall was not constructed. So the actual man-made portion is 6,230 km long. The builders were military men and paid laborers. Construction materials included mud, brick and rock. In some areas, the new wall incorporated previously built walls from 1,000 years earlier. New material was simply added on top of what was already there. On one brick, our guide pointed out an insignia which showed (in Chinese, naturally), the year (1579) of construction and the name of the unit that built that particular tower. 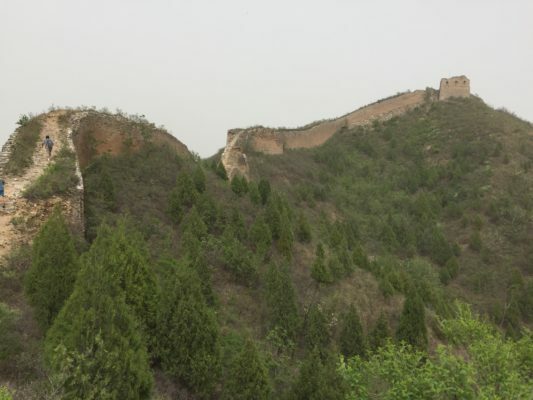 There are 600 kilometers of the Wall located in the vicinity of Beijing. The section I visited is 130 km northeast of the city. Called Pan Long in Chinese, meaning Winding Dragon, it is aptly named as it curvaceously crosses the expansive mountainous terrain. And now in spring, trees and shrubs are newly leafed out and there is a profusion of wildflowers. Our small group traverses approximately 9 km, passing through twenty or so guard towers in various states of disrepair. This section of wall has not been renovated and the footing is challenging due to the many missing bricks and stones. In fact, during the Cultural Revolution, the government encouraged farmers living in proximity to the Wall to remove bricks and stones to build farmhouses. Likely because of the condition, this section of the Wall is sparsely touristed. We see only a handful of other hikers during the afternoon. The only unfortunate thing, if one can really complain about anything while on the Great Wall, is that an unexpected dust storm blew in overnight from the Gobi Desert north of us making the air thick, yellow, and murky. The result was restricted visibility and it was difficult to see the contrast between the wall and its surroundings. Even so, I could not go too far without stopping often to admire and to reflect upon the accomplishment of this remarkable endeavor. Under better weather conditions the astronauts in orbit can see the Great Wall!